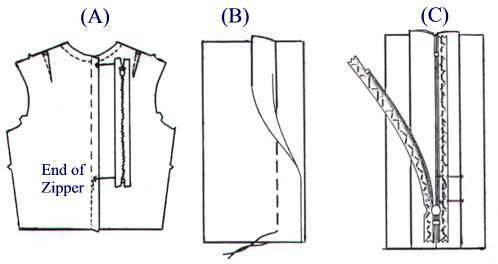 Sew the garment seam to the point where the zipper will be inserted (A). Baste the remaining seam allowance where the zipper will be inserted. Press the seam allowance open (B). 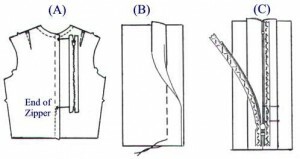 Place the garment wrong side up (C). 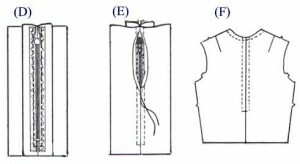 With the zipper open and the correct side of the zipper facing down, align the zipper teeth against the basted seam allowance. Pin in place. With the wrong side of the garment and zipper still facing up (D), stitch from the top edge of the garment, and 3/8” away from the zipper teeth. Stitch just beyond the bottom of the zipper. Turn and stitch across the bottom of the zipper tape. 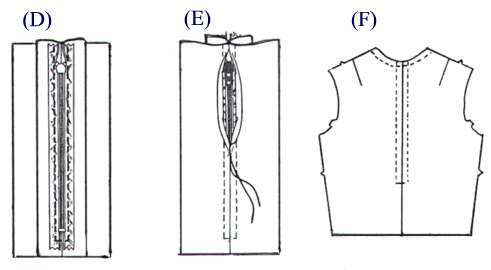 Next week we’ll show you how to do a lapped seam zipper.